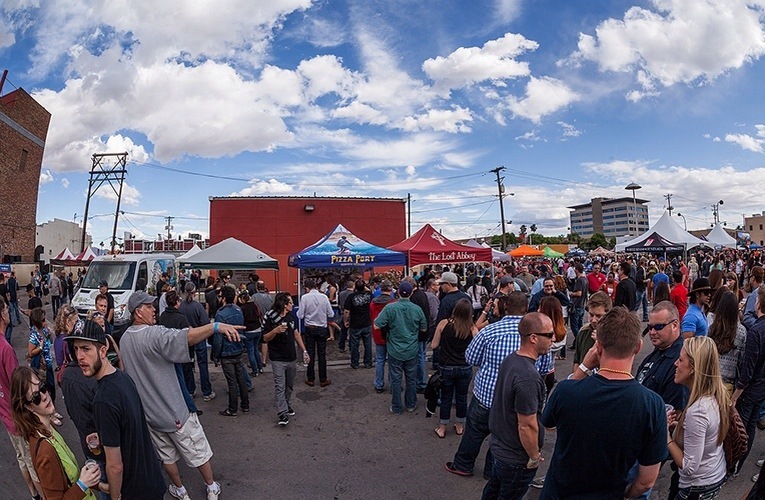 On April 26th, the fine folks at Motley Brews, along with 80+ breweries, descended upon downtown Las Vegas, and unleashed the 2014 Great Las Vegas Festival of Beer. 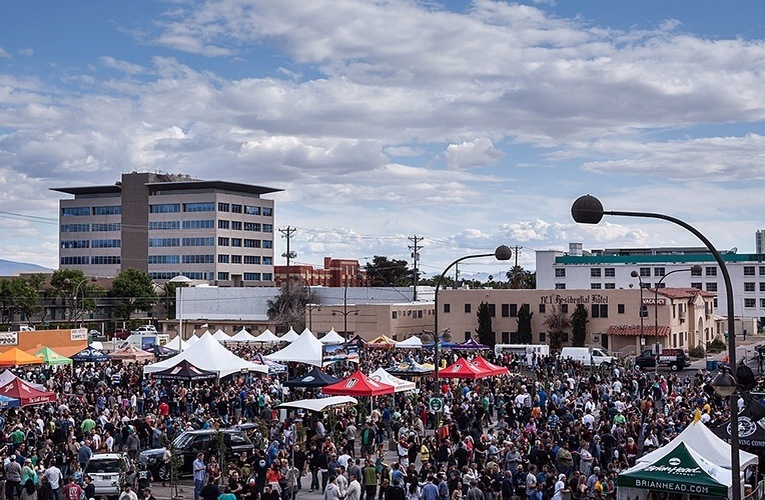 This year’s incarnation was both the biggest, and arguably the best festival to date, boasting more events, breweries, and food than ever before. Downtown was a fantastic setting, giving plenty of space for festival goers to enjoy the event without feeling like a sardine. It was also the perfect location to continue the festivities once the festival had ended. All in all, I hope that this location is utilized again. For this year, we decided to go with the VIP option, which I do feel was worth the extra money. Aside from early entry, the first nice perk was the tasting glass. VIPs received a glass Oskar Blues logo tasting snifter. Granted, I’m sure many of these met their demise upon the asphalt and concrete surfaces, it was still a very nice touch, and a nice souvenir to take home. Inside of Commonwealth, aka The Brewer’s Lounge, VIPs were treated to a variety of different beers, including both Epic Brewing Company selections, and up-and-coming locals Crafthaus. Upstairs had a selection of beer cocktails, which in my humble opinion, were very hit or miss, but I still enjoyed the creativity and effort. The real highlight, however, was the food selection next door at La Comida. La Comida presented a variety of small plate dishes such as carne asada tacos, tamales, sopas, and an amazing tuna dish, all of which were top notch and delicious. If anything, the extra price of VIP was worth it for the food alone, but being able to drink Crafthaus offerings pushed it over. My only complaint would be the massive line to enter, which was a mix of both VIP and early entry tickets. A separate VIP line would have been fantastic, albeit not critical. Now, without further ado, let’s get into the most important aspect of any festival…the beer! If you’ve ever been to a beer festival before, you pretty much know the score here. You take your 4oz. cup (or glass in this case), visit multiple breweries, and sample their fermented goods. What really makes some of these events special are the one-offs, rarities, and wild card breweries that show up. For the first time ever in Las Vegas, we were treated to The Lost Abbey pouring some of their beers. They brought Carnivale, Lost & Found, and Judgment Day, which were all fantastic. I personally recommend a visit to their brewery if you are in the San Diego area. We also got to try beers from soon-to-be-distributed to Vegas, Sonoran Brewery out of Phoenix, Arizona. While their English IPA and Saison were both solid takes on the style, it was the White Chocolate Ale that really took the cake. Not to be confused with the stout of the same name from The Bruery, White Chocolate Ale is actually a wheat beer that boasts a huge chocolate candy flavor, while maintaining the light flavors of the wheat beer. If all goes well, you should be able to find this on store shelves shortly. 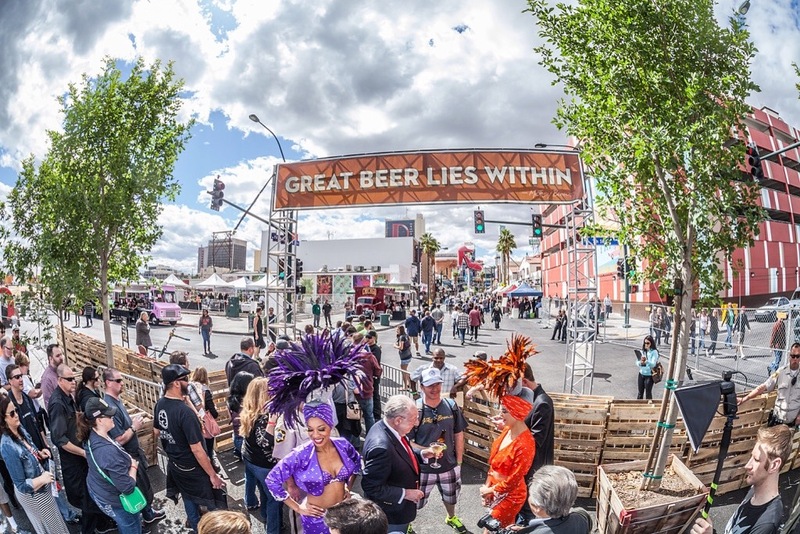 As they have in past fests, Nevada breweries stepped up and brought some great choices along with them. Joseph James had Coffee Magic Sticke, which is their altbier blended with coffee. This wonderful concoction ended up being one of my favorites of the entire fest. Tenaya Creek offered up a cask conditioned version of their stellar Red Ryder Ale and a coconut version of their brown ale, which seems to never fail to please. Big Dog’s was serving their amazing new Carlsbad IPA, which was another festival highlight for me! Assistant brewer Tom Harwood perfectly captured the west coast IPA flavor on this one, and I look forward to what he does in the future. Another Nevada brewery highlight for me was from relatively new brewery, Under the Rose Brewing Company from Reno. They had their Blondebeer aged in pinot noir barrels, which reminded me of a saison mixed with a sour. Local downtown brewery Banger Brewing had a refreshing watermelon wheat beer, called Sandia, which was nice on a warm afternoon. The Nevada Craft Brewers Association collaboration beer, Sweet ‘N Funky Desert Junkie, was available, and Great Basin had a sour Belgium Black Cherry Beer, which sadly, I don’t remember trying. 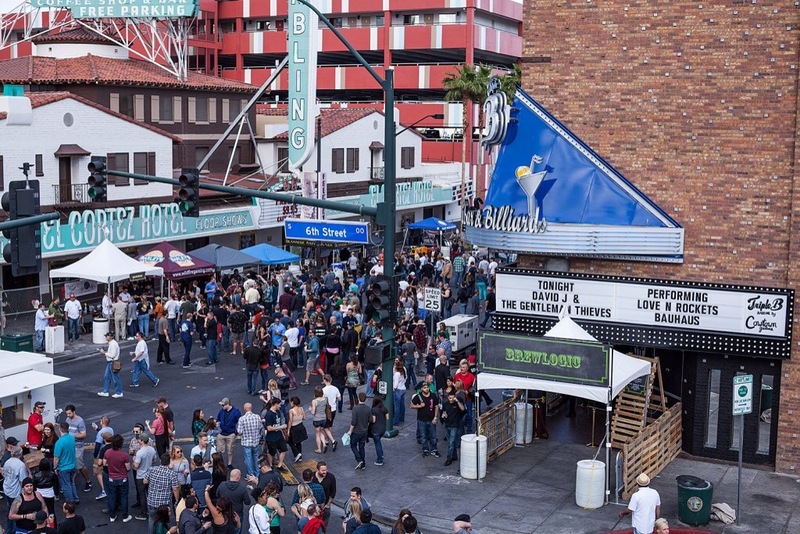 Many of these beers were found at the Nevada Craft Brewers tent, which was a cool “one-stop shop” for some rare Nevada beers. Many other breweries made their return, but I don’t think I would ever finish this if I named them all. Some highlights though, included the return of Pizza Port to Las Vegas. I wasn’t able to sample all of their items, but the Grapefruit Puncher, which was an IPA mixed with grapefruit juice, was just outstanding. The trend of well crafted sessionable IPAs continues as Firestone Walker was pouring Easy Jack, which should go down great in this desert heat. The other food options were also plentiful and great. Every year, Motley Brews brings in great vendors that give patrons many options when it comes to grub. To be honest, I simply stuck with the free VIP, but several people in my group sought other options. I can’t speak much to them, but Truck U BBQ, Sausagefest, and Naked City Pizza all got rave reviews. To be fair, any food you find at one of these festivals will be worth your hard earned cash. Brew Logic was another cool addition to this year’s festivities, giving people the option to enjoy guided tastings and other fun beer related events. There was a guided tasting of sours, hosted by Atomic Liquors, and a beer, cheese and chocolate pairing. These were great ideas and got positive reviews. I’d like to see a more of these in the future as I find them a great way to get people to open up to trying new things.